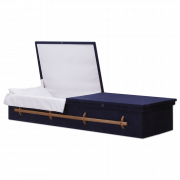 When a body is cremated it must be in a container that fits certain specifications, including being fully combustible and rigid. The materials used in the construction can be anything from wood to cardboard. Other materials include wicker, bamboo and cloth-covered wood. 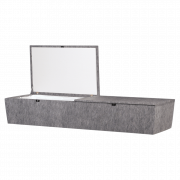 Even traditional caskets are sometimes used. The only materials that cannot be used is metal. Since the container must be able to completely break down during the cremation process, it cannot have any metal parts.